I'm posting this here due to the responses on another thread that this information is not out there. I thought it was common knowledge that this conversion is possible; that's why I originally took the plunge myself. I was going to originally wait for the SGM ten round magazines to come out, but when they did, the reviews were that about half of them did not work properly. So, I decided to go ahead and convert it to take m26 mags. I would not attempt to do a conversion to a staggered-feed magazine like a PSL or SVD. Possible, I'm sure, but IMO not worth the extra effort or cost. The m26 mag is almost like it is made for this conversion. The "lug" on the bottom of the bolt just fits between the feed lips and gets more than ample purchase on the case rim. 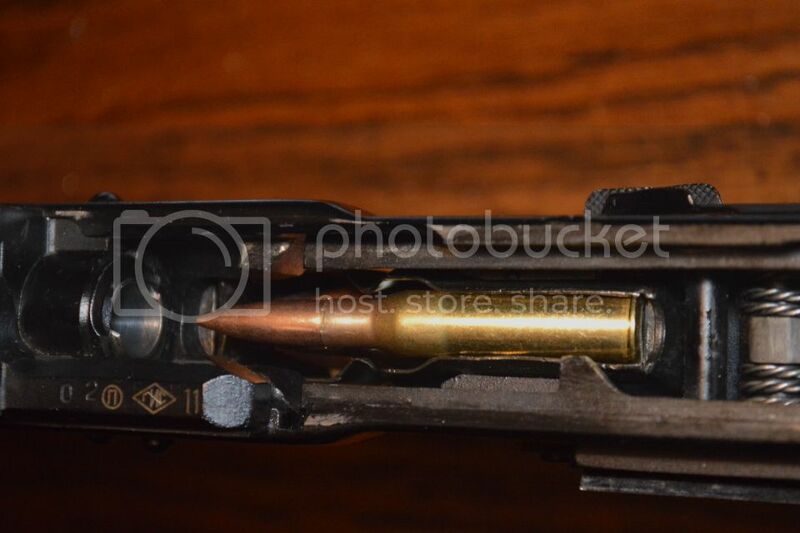 The front of the magazine buts up on the trunnion shelf at just the right height to aim the bullet nose into the chamber. No mag alterations are necessary, although you could weld typical ak-like tabs on them if you want to do less work on the gun itself. The magazines are not the best quality, but not Pro-mag bad either. The unique floorplate would make it easy to shorten the magazine if desired. Plate welded in front due to factory mag being longer. Plate is just thin enough to wedge in between receiver and trunion. 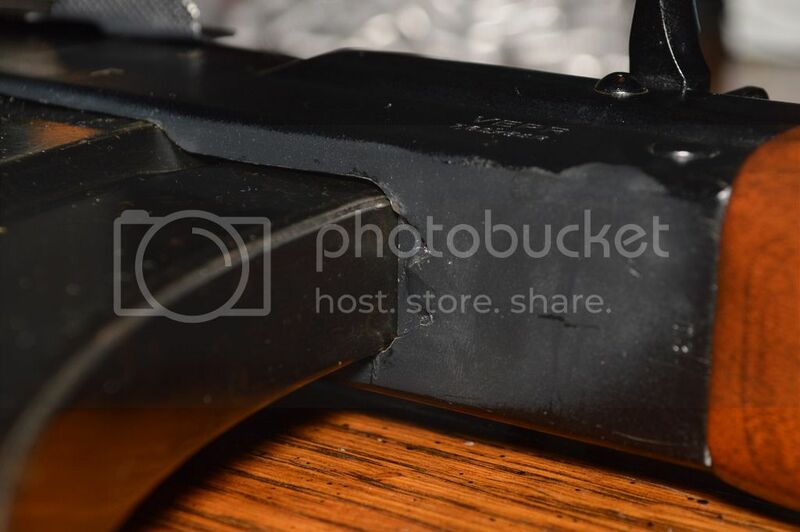 Metal plate added to mag release to extend it to notch in magazine. Difficult to see, but two plates added to lower flanges on rails to brace magazine against lateral movement. 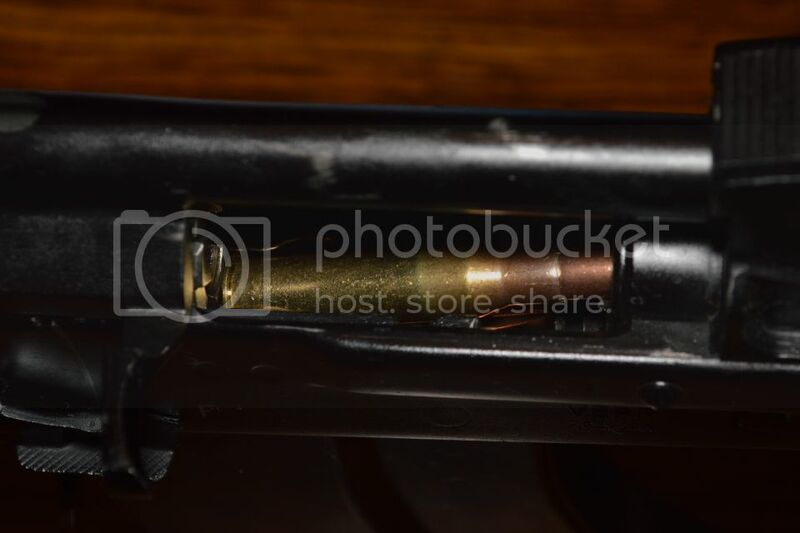 Cartridge being stripped from magazine by bolt showing relationship of the three with respect to each other. All in all, it is a fairly straightforward process. Open up mag-well. Add front plate. Add side plates and file down until rear of magazine comes up high enough in relation to the bolt. Add plate to mag lever and file to fit. Add rear plate and file to fit. Done this way, the magazine is rock solid. Does opening up the mag-well weaken the receiver? Of course it does. After all, removing metal does not increase strength. How much? I don't know. The gun still feels plenty solid. I'm not concerned about it. You could weld braces inside the receiver but I currently don't see any need. Hope this helps. Have you fired this configuration much? Yeah, how does it feed, cycle, etc? I used to have a L26 mag but got rid of it. Csspecs: In this final configuration I'm ashamed to say I haven't shot it a whole lot. I shot it enough to satisfy myself that it is "complete," but probably no more than a couple hundred rounds. I simply can't afford to shoot as much as I would like, and my time and money are spread pretty thin. But bear in mind, this is the final (so far) configuration; I shot it quite a bit along the way. First I assumed I would have to go the "tabbed magazine(fore and aft)" route and started with the front tab on the first magazine. 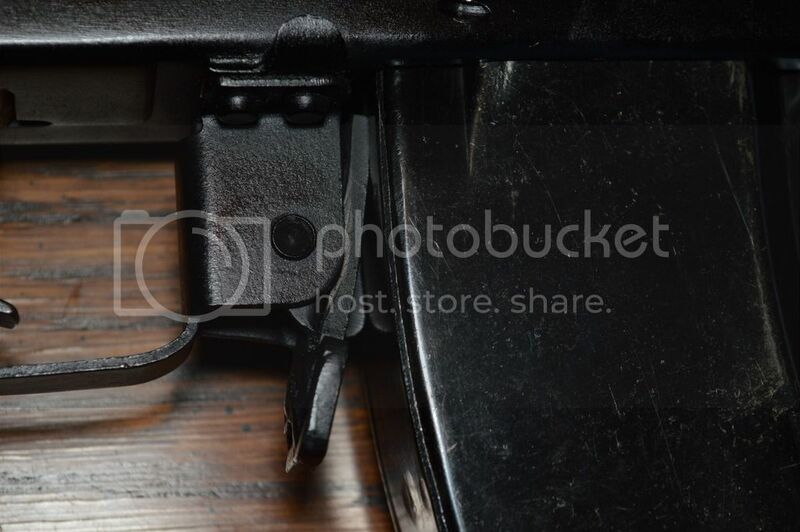 While filing down the tab to allow the rear of the magazine to come up high enough, I realized the rear mag catch notch wasn't far off from where it needed to be. So I decided to weld the plate on the mag release lever to keep from having to put the rear tab on every magazine. This worked fine, but after some use, I was not satisfied with the lateral play in the magazine. Ergo the two pieces added to the rails. Then I started to wonder if it would be possible to do away with the front tab on the magazine. The front of the magazine cutout did not have enough surface area to prevent from digging into the magazine upon recoil, so a more substantial plate was necessary. The magazine could still move backward against the spring pressure from the mag release lever, so it needed to be braced on this side as well. Being braced on all four sides alleviates the need for tabs on the magazine. It was a simple solution that seems to work well and was simpler than making a true mag well to fit the curved magazines. I should take some time to give a general disclaimer, here. I am not a certified gunsmith and the information given here is for informational purposes only, etc. Modifying a gun could be dangerous or cause costly damage. Be sure to be 922r compliant, all NFA rules apply, etc. BTW, the floorplate is extremely simple to fabricate for a compliance part, and the springs are pretty simple as well. Any more updates? Feed, fire and extract/eject ok? The bolt slide in between the mag sides ok enough to strip the rounds out? Like I said, it works perfectly. 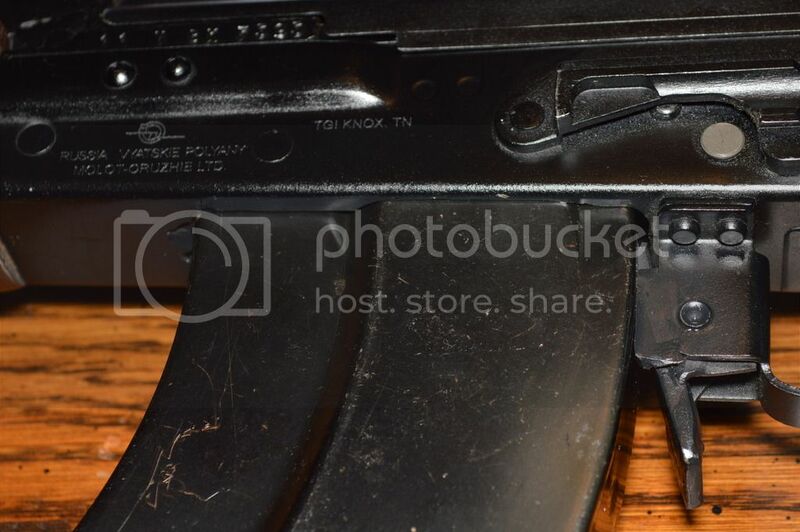 Question on these mags for the conversion. How many rounds have you been able to consistently load and cycle? I have read many threads where the most that these mags will reliably cycle is 12-15 rounds. Seems like a lot to mod a rifle for not a 20 round capacity. Awesome! I hope you can bring them to market. Where did you read this? 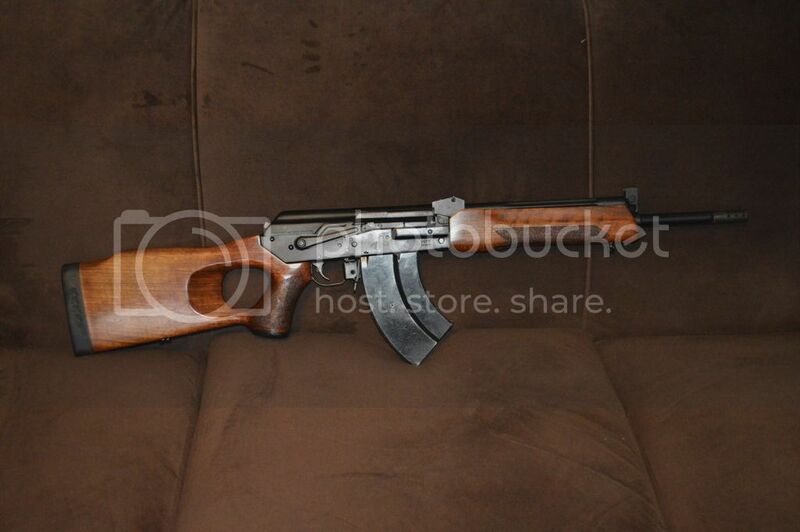 SO far he is the ONLY Vepr owner to have tried this, after searching here, AKFiles, and Google. I would be interested in reading this as well. Any links?